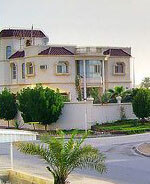 Property prices in Bahrain continue to soar. Manama, the capital, has experienced Bahrain's highest property price growth, at around 600% over the past three years. Prices in other towns have climbed about 400%, according to local property developers. In Juffair, located in south Manama, the average selling price of an apartment is BHD830 (US$2,202) per sq. m.; 66% up from BHD500 (US$1,326) two years earlier, according to Tameer Research. Land prices have followed apartment prices up, soaring by around 120% annually since 2003. In June 2008, the average selling price of residential land was BHD402 (US$1,066) per sq. m., according to Al Mazaya Holding Co. Rental rates have risen, but not so strongly. In 2008, the average rent for a three-bedroom apartment in Manama is BHD781 (US2,072) per month; 11.3% up from a year earlier, according to UN International Civil Service Commission. Higher oil revenues and foreign investments have pushed up Bahrainis' purchasing power, stimulating housing demand. Liberal real estate laws, freedom from tax, and easy home financing have added to the real estate boom. Foreigners, resident or not, can now freely buy property and rent it out in Ahmed Al-Fateh, Hoora, Bu Ghazal, Seef, and Northern Manama, which are all in the capital city, Manama. Foreigners can also buy in Durrat Al-Bahrain, Amwaj Islands, and Dannat Hawar - reclaimed areas earmarked for tourist developments. Owning a property in Bahrain also brings with it permanent residency rights. Yields are estimated by local realtors at well over 10%, given the present shortage of properties for rent and strong demand. The rental market is almost entirely foreign-driven, and has grown greatly since the massive increase in US army numbers, who live largely in Juffair. More recently the Saudi oil boom has meant a substantial increase in new residents, who drive across the straits rather than live in Saudi. The World Trade Centre is another attraction. Finally, the construction boom itself is fuelling rental demand. There are no income taxes in Bahrain. There is no withholding tax, capital gains tax, gift or inheritance tax. Rental Income: A 10% municipal tax is levied on all properties leased to expatriates. The system is the same for residents and nonresidents. The total cost of buying and selling a property, in Bahrain are very low, from 2.35% to 8%. Registration fees are generally around 1.50% to 3%, but lower rates of 1.35% to 2.70% may apply subject to certain conditions. Real estate agent’s fee is around 1% to 5%, payable by the seller. Bahraini landlord and tenant market practices are PRO-LANDLORD. Rents: Initial rents can be freely determined, as can rent increases. Three months' rent are paid in advance before a tenant can move in. Tenant eviction: Landlords must serve a 60-day notice for termination of tenancy. In the absence of notice, tenancy agreements are automatically renewed on a monthly basis. The Kingdom of Bahrain, with a population of around one million and a land area of 717 sq. km., is the smallest of the GCC countries. The country has a strong economy with 6.2% projected GDP growth for 2008. Bahrain is one of the founding members of the World Trade Organization. In 1971, it became a member of the United Nations and the Arab League. Then in 1981, Bahrain became one of the six founding members of the Gulf Cooperation Council (GCC). In September 2004, the U.S.-Bahrain Free Trade Agreement was signed. In 1932, Bahrain became the first gulf state to discover its oil resources. Revenues from oil had brought improvements in the quality of education and health care in the kingdom. However, the declining oil production and reserves had urged the Bahraini government to diversify the economy. The kingdom has transformed itself to become the Gulf’s financial and banking centre. The manufacturing, real estate, construction, services and information technology sectors have also benefited from the economic diversification plan. Bahrain is the most democratic country in the region. In 2001, Bahrainis strongly backed proposals put by the emir - now the king - to turn the country into a constitutional monarchy with an elected parliament and an independent judiciary. Elections were held in 2002 for the 40-member Council of Deputies, the first such poll in nearly 30 years. The new body includes a dozen Shia MPs. The country has been enjoying increasing freedom of expression even in the local context, and monitors report that the human rights situation has improved. The kingdom has the freest economy in the Middle East and is the 19th freest economy in the world, according to 2008 Index of Economic Freedom by Heritage Foundation.